1. June 3, 1948 – the 5 meter (200 inch) reflecting telescope at Mt. Palomar Observatory is dedicated in honour of George Hale. York Universe host Jesse Rogerson performed observations with the telescope in the fall of 2012; see his blog for details. 3. June 8, 1625 – Giovanni Domenico Cassini born. Discovered 4 of Saturn’s moons: Tethys, Dione, Rhea, and Iapetus. Discovered the ‘Cassini Divisions’ in Saturn’s Rings. Also credited with the discovery of the Great Red Spot on Jupiter. 2. Proxima Centauri to eclipse background stars. It may seem like stars are fixed in their spots on the sky, however, every star in the Milky Way has some motion, which astronomers call ‘proper motion.’ The change in a star’s position on the sky as a result of proper motion is too small for us to discern over a human lifetime. Astronomers can, however, measure a star’s speed and trajectory in space and therefore predict the future path of a star. The closest star to the Sun, Proxima Centauri, has one of the largest proper motion (this makes sense, the closer something is to us, the faster it will appear to be moving). It is predicted that in 2014 and 2016 Proxima Centauri will move into a position that eclipses, or nearly eclipses, two background stars. As a result, astronomers will be able to measure the mass of the star independently, and even look for exosolar planets. Suggested Reading: Hubble Space Telescope Press Release. 3. Three new astronauts join the ISS. American Karen Nyberg, Russian Fyodor Yurchikhin, and Italian Luca Parmitano joined the crew of Expedition 36 on May 29, 2013. Check out the mission page for more details. Major details: the crew will perform science experiments, most notably from Japan (Aniso Tubule) and ESA’s SOLAR experiment; 5 spacewalks are schedules for the duration of the mission. ISS related info: ESA is launching up ATV4 supply mission going up on the June 7th, dubbed Albert Einstein. Can Carry a london double bus inside. China is getting set for its next crew launch. The launch window starts this week and goes through June/July. 5. Curiosity Corner with Ryan-Marciniak-stand-in, Lianne Manzer. Initial reports of Gale crater being the location of an ancient river bed have been confirmed through more analysis of the data taken during the first 40 days of Curiosity on Mars. Suggested Reading: NASA press release. The Milky Way, the galaxy in which we live, is a spiral type galaxy. Its shape would best be described as pancake-like: it’s flat, it’s round, and has very prominent spiral arms. The 100-billion (or so) stars in our galaxy orbit the centre of the Milky Way much like the planets in our solar system orbit the Sun. As an aside, the other major type of galaxies are Ellipticals, which are shaped more like rugby balls. When we look out into the universe at other spiral galaxies, like M51, M101, or this beauty for example, it is fairly easy to discern the internal structure. We can see the large central bulge, count the number of spiral arms, and/or determine the presence of a bar. It is much harder to find and analyze the internal structure of the Milky Way, because we are looking at it from within. Nevertheless, great progress has been made in the understanding of the structure of the Milky Way. Our Sun is located in what’s known as the ‘Local Arm,’ or ‘Orion Arm.’ This spiral arm is located between two very large arms: the Sagittarius Arm (closer to centre of MW) and the Perseus Arm (closer to the edge of the MW). Originally, the Local Arm was thought to be a small spur between the two other mighty arms of the Milky Way, but recent research is showing that our Local Arm is a lot bigger than we thought. To determine this, researchers from a variety of institutions including Harvard-Smithsonian Centre for Astrophysics and the Max-Plank Institute for Radio Astronomy, set out to use the National Radio Astronomy Observatory to measure the distances to stars. The astronomers used data from the BeSSel Survey (Bar and Spiral Structure Legacy Survey), which is a survey to study the internal structure and kinematics of the Milky Way by measuring the parallax distances and proper motions to star forming regions. The 10 radio dishes being used are specifically looking for methanol and water maser emission that are associated with young massive stars and compact HII regions that are known to trace spiral structure. The resulting measurements showed our Orion Arm is much bigger than once thought. They determined the length to be approximately 5 kiloparsecs, and its angle to be more similar to that of the other two major arms. 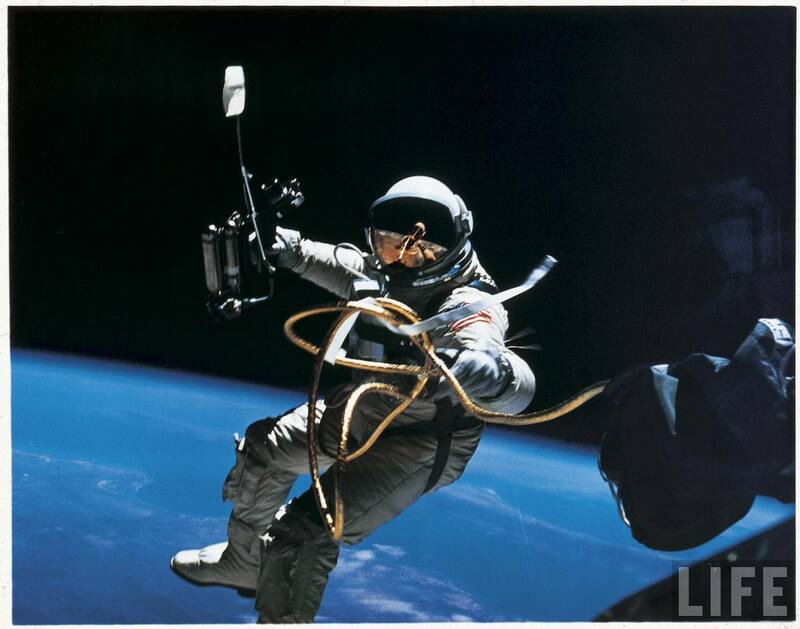 Two types of radiation pose potential health risks to astronauts in deep space:1. Galactic cosmic rays (GCRs): particles caused by supernova explosions and other high-energy events outside the solar system 2. Solar energetic particles (SEPs): associated with solar flares and coronal mass ejections from the Sun. 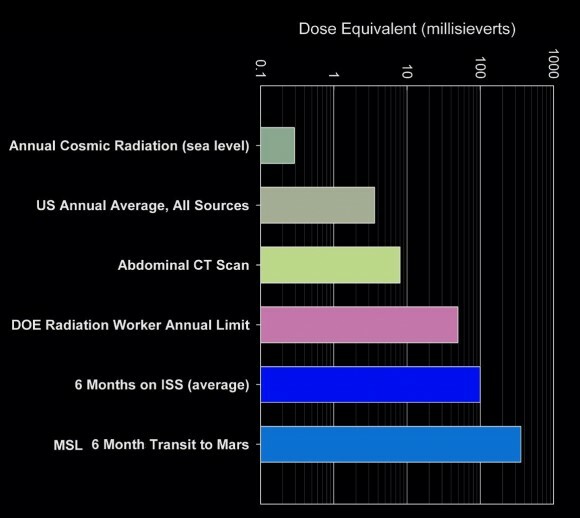 Radiation exposure is measured in units of Sievert (Sv). Studies have shown exposure to radiation increases a person’s lifetime cancer risk . Exposure to a dose of 1 Sv, accumulated over time, is associated with a 5 percent increase in risk for developing fatal cancer. “In terms of accumulated dose, it’s like getting a whole-body CT scan once every five or six days,” said Cary Zeitlin from the Southwest Research Institute (SwRI) in San Antonio, Texas. GCRs tend to be highly energetic, highly penetrating particles that are not stopped by the modest shielding provided by a typical spacecraft. Extra shielding is needed! Can be solved by: increased shielding and more powerful propulsion. The surface data will be published in the next few months. You can answer via email, fb, twitter, or shouting really loudly (though we may not hear that). This entry was posted in Show Notes and tagged Local Arm, milky way, NASA, radiation. Bookmark the permalink.